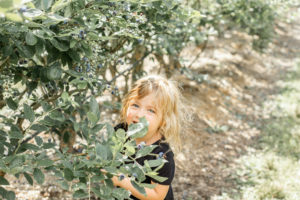 Things To Know Before You Take Your Kids Blueberry Picking! Sure it may seem easy to just go and grab a box of blueberries from the store and call it a day. 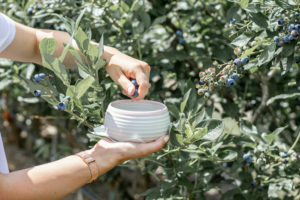 But with this gorgeous Summer weather we need to take advantage of just soaking in the sun and teaching our kids the beautiful ways of providing and working for what we get! I’m not talking about child slave labour, I’m just saying that it shows kids so much more pleasure when they pick what they eat! 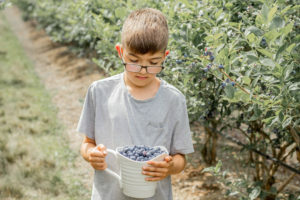 I remember when I was a kid and of course I hated it in the beginning when my mother or grandmother would drag us to a field on a hot Summer day. It didn’t take me long to actually appreciate it and love it as a child. It created so many memories that didn’t include a electronic. It was chill and easy and we got to eat some of what we picked. We were so proud of the haul we’d come home with! And now whenever I smell fresh Strawberries I always remember my late grandmother who spoiled us! MEMORIES! 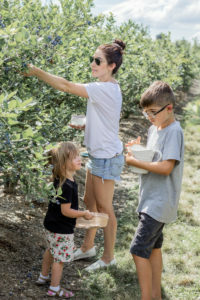 I try really hard to take my kids at least once a Summer to pick any kind of berry. 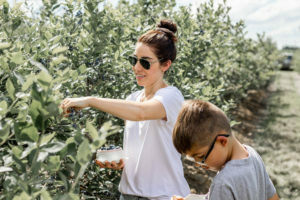 Every year we definitely get to the blueberry field that’s local to us. We really love it there. 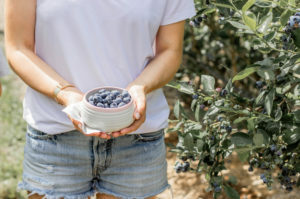 That and blueberry fields in BC are way different and easier to pick than in NS! Hahaha. The berries are bigger and juicery. Trees are tall and full, not short and stubby like back home. Such a difference! From my experience trekking kids picking over the years, I’ve come up with some things you should know before you go…. Yes, they will totally complain. Neither beginning or when they feel like they’re done. It’s going to happen. Bring a few toys, books anything to help distract for a little bit! Sunscreen Camera Hats Water Blanket to sit on. All of these things because it will get warm! Pack the bag full of snacks. Even though your picking a snack you don’t want them eating everything they pick or get an upset tummy from eating too much! Been there! They do have buckets there and weigh for you! So just in case bring an extra bucket. Maybe a special one for each child to make them feel proud! Wear a watch to keep track of time. I would leave the phone in the car and just enjoy everything in peace with your kids! 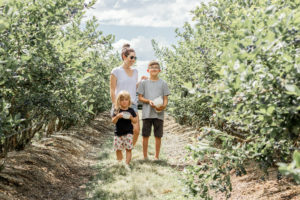 Give a quick call and ask any questions you may have before going and you can also visit BC Blueberry to find u-pick locations and information in your area! 7. Go early in the day!!! Gentle Hands is always a good reminder for the little ones to! Hahaha Don’t pick the green ones. I would also take half of their bucket once it gets fuller so they don’t spill! Breathe a little and rest with them. Make a day out of it but defiantly make it fun and not make it work! They’ll be so proud of themselves and what they provided for their family that day!